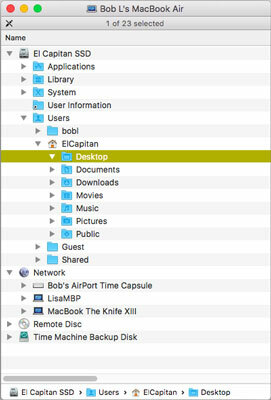 Start by looking at the folder structure of a typical OS X El Capitan installation. Open a Finder window and click the icon for your hard drive (typically called Macintosh HD) in the Sidebar. You should now see at least four folders: Applications, Library, System, and Users. Within the Users folder, each user with an account on this Mac has his or her own set of folders containing documents, preferences, and other information that belongs to that user and account. If you’re the sole person who accesses your Mac, you probably have only one user. Regardless, the folder structure that OS X uses is the same whether you have one user or dozens. Within the Users folder, you find your personal Home folder (which bears your Account Name), along with a Shared folder, where you can put files you want to share with other users. All these files are stored in a nested folder structure that’s a bit tricky to understand at first. This structure makes more sense after you spend a little time with it and figure out some basic concepts. If you display the path bar (at the bottom of your windows; choose View→Show Path Bar), it’ll start to make sense much sooner. Take a look at the figure; you can see how these main folders are related to one another. A bird’s-eye view of key folders on your Mac.